The ISW-511TS15 from Planet Technology allows for worldwide operaton, offering even more efficiency and stability. The ISW-511TS15 is a 4-Port 10/100Base-TX with 1-Port 100Base-FX Industrial Ethernet Switch. Designed specifically for wide-temperature environments, the ISW-511TS15 offers wide-operating temperatures ranging from -40 up to 75°C. The ISW-511T / ISW-511TS15 provides a high level of immunity against electromagnetic interference and heavy electrical surges typical of industrial environments.The ISW-511T and ISW-511TS1 are ideal for transportation, manufacturing, security and surveillance network deployments. The ISW-511T and ISW-511TS15 units feature four 10/100Base-TX auto-negotiation ports and one 100Base-FX port. The ISW-511T is equipped with a 100Base-FX multi-mode SC interface to reach transmission distances of up to 2km and the ISW-511TS15 is equipped with a 100Base-FX single-mode SC interface to reach transmission distances of up to 15km. . The unit offers dual-redundant, reversible polarity (12V DC to 48V DC) power supply inputs to support applications requiring dual or backup power inputs.The ISW-511T and ISW-511TS15 also offers slim for factor that allows either DIN rail or panel mounting. The ISW-511T and ISW-511TS15 are equipped with four 10/100Mbps ports with MDI / MDIX and one 100Base-FX fiber-optic SC interface. With 1 GPS non-blocking switch fabric and a 2K MAC address table, the ISW-511T and ISW-511TS15 can reliably deliver packets at wire-speeds. The unit is ideal for industrial environments. 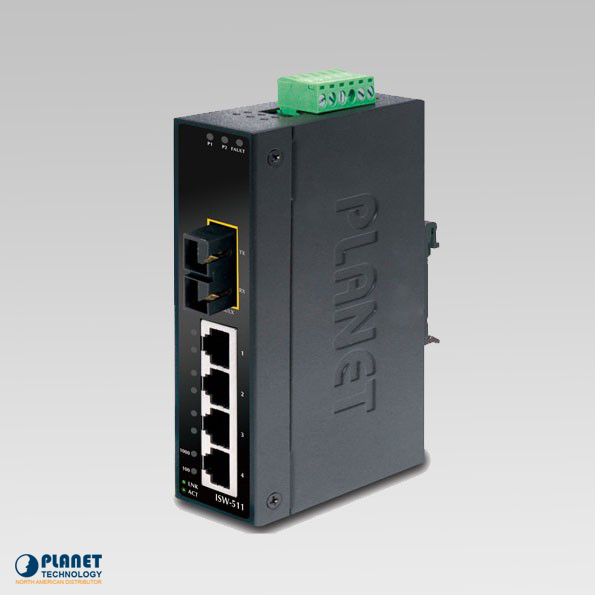 The ISW-621TS15 is an innovative 4 port +2 port 100FX Port Single-mode Industrial Ethernet Switch – 15km that operates efficiently in temperatures ranging from-40~75 degrees Celsius. The industrial hardened Ethernet Switch from Planet Technology features a sleek, slim metal casing and 4 10/100Base-TX Auto-negotiation ports. The ISW-621T features stable operation is various temperatures ranging from -40 up to 75 Degrees C.